The Los Angeles Football Club was searching for a place to train, so they visited California State University, Los Angeles. On this 175-acre campus, the club’s leaders found much more than the requisite soccer field and locker rooms. They found a university that shares the club’s commitment to the city and its youth, an educational partner with which they could build a legacy. 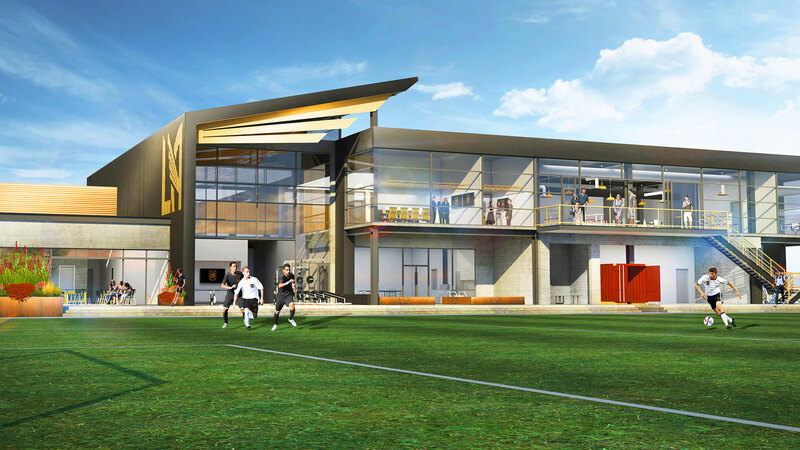 Today, Cal State LA is the home of the LAFC’s $30 million training facility, headquarters and youth academy. A new building under construction at the northern gateway of campus is expected to open its doors in the spring. The city’s newest Major League Soccer team will train at Cal State LA and play its games at a stadium under construction in Exposition Park. LAFC president and owner Tom Penn called Cal State LA the perfect home for the club. 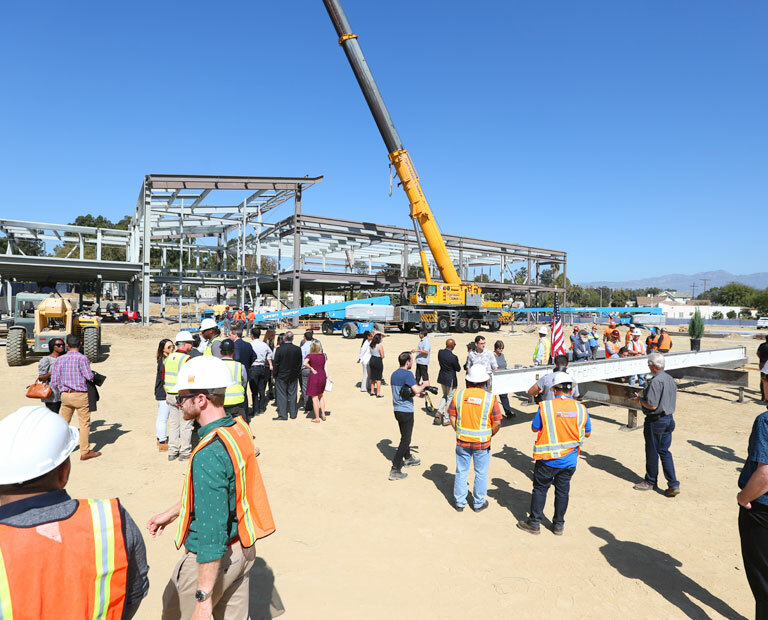 “We are proud that we will be developing world-class players and talent for decades to come at Cal State LA, which has a history of elevating the communities it serves,” Penn said when the partnership was announced last May. The new training site and practice facility will feature a practice field, locker rooms, sports medicine facilities and office space for coaches and staff. 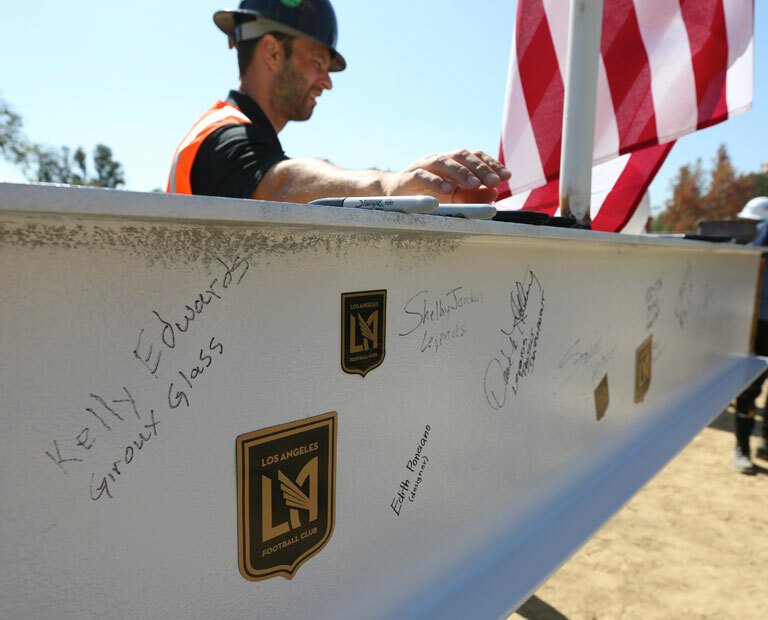 It is designed by Gensler Sports and completely financed by LAFC. Even as the building rises, the partnership is already bringing opportunities and new energy to the bustling campus. The LAFC committed $1.6 million in support for Cal State LA, including funding a renovation of the University’s Jesse Owens Track in the Billie Jean King Sports Complex. The stadium now boasts a new track, soccer field and lighting system. Cal State LA students will also benefit from internships with the LAFC, which is owned by a group of civic, sports and business leaders. The group includes Magic Johnson, Mia Hamm Garciaparra, Nomar Garciaparra, Mandalay Entertainment Group Chair and CEO Peter Guber, actor Will Ferrell, and co-founder and former CEO of YouTube Chad Hurley. “This is a big win for our students and our athletics program,” says Cal State LA Executive Athletics Director Daryl J. Gross. Cal State LA President William A. Covino sees the University’s relationship with the LAFC through a long lens. “The benefits of this partnership to Cal State LA and the region we serve will surely multiply over time,” Covino says. Lead Illustration of the future LAFC training facility, courtesy of LAFC.